Roman ruins are not the first thing that you think of when you decide to visit Tunisia. Most people look forward to the Mosques and Kasbah’s. But if you are history buff, the Roman ruins of Tunisia are some of the most spectacular in the world. In fact, El Djem amphitheatre is the world’s best preserved Roman amphitheatre, ranking even more highly than Rome’s Colosseum. The name of the Roman colony near El Djem Amphitheatre was Thysdrus. It was built approximately 1800 years ago and is one of the latest monuments of its kind built in the Roman Empire. 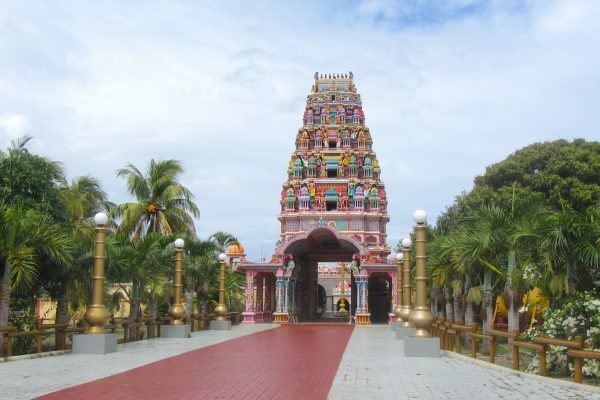 It has therefore benefitted from three and a half centuries of experience which is reflected in the architecture. El Djem Amphitheatre is a UNESCO World Heritage Site. The town was built on a crossroads, which allowed for olive oil production to be opened up to international commerce. This lead to the wealth of the city and the finances to build such a monument. 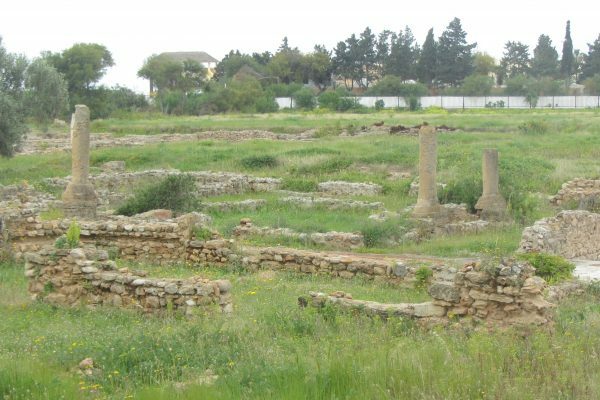 Thydrus was the second North African Roman city after Carthage. The amphitheatre consists of three floors (four according to some sources), with many arches. 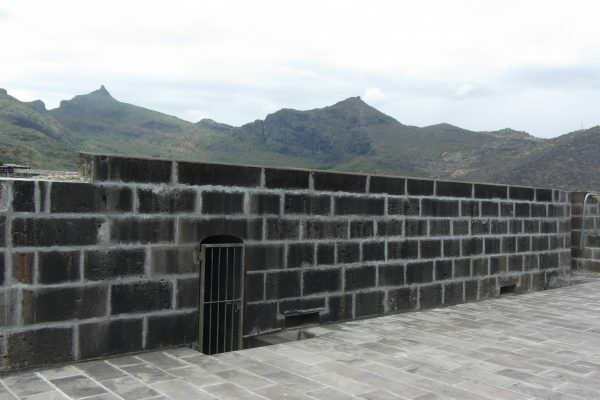 The height of the walls exceeds 30 meters. The stairs leading to the different concentric galleries are built over leading vaults. The amphitheatre itself would have been used for spectators to observe gladiator style battles. 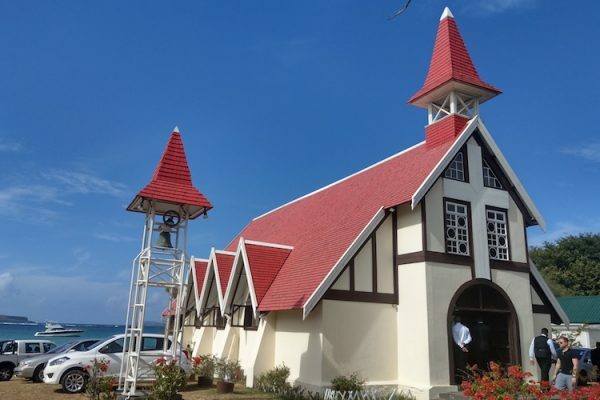 It was built to house approximately 35,000 spectators. 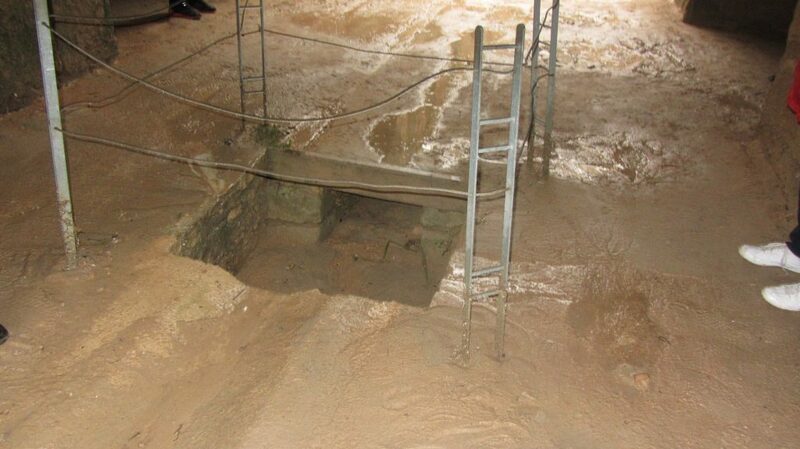 Were these Roman drains (above) built for draining away the blood after a gruesome battle?! The scale of El Djem is vast and although it is not as big as the Colloseum, the quality of it is better and it is better preserved. However, a key reason to visit El Djem at the moment is that it is almost clear of the annoying mass tourism at Rome and other main Roman sites of Europe. Following the terrorist attack on a beach in Sousse in 2015, tourism in Tunisia has severely declined. Since the main holiday companies such as TUI and Thomas Cook started to return last year (2018) and the FCO reduced the threat level of the country (from ‘advise against all but essential travel’ to ‘see advice before travelling), tourism has started to slowly increase. 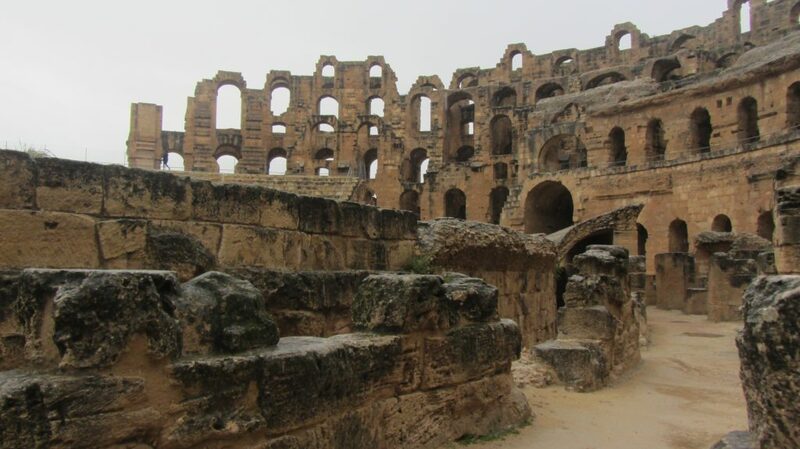 However, many sites such as El Djem and Carthage are currently almost deserted. During our time at El Djem (March 2019) there was just one other school group and maybe 5/6 couples exploring at the same time as our group. We also had the Roman baths at Carthage pretty much all to ourselves! Going underground at El Djem! Make sure that you go underground at the El Djem Amphitheatre. You will discover extensive irrigation systems and tunnels. Underneath the amphitheatre were many sections where slaves and wild animals were kept. You can take a train to El Djem from Tunis (approximately 3 hours). It’s about 80km from Monastir and Sousse is even closer. You can take a taxi from these cities or take the train from Marchandise Sousse in under an hour. There are many Tunisia tours that include El Djem. The benefit of a tour is that you get more of an insight into the history of El Djem. Visit either first thing or in the second half of the day to avoid the tour groups. Entrance is 8 Tunisian Dinars (at time of writing – March 2019). Expect to go through security checks and bag checks when you enter. Wear comfortable walking shoes for going up the tiers and down underground. Take plenty of water especially if visiting during the summer as it can get hot. 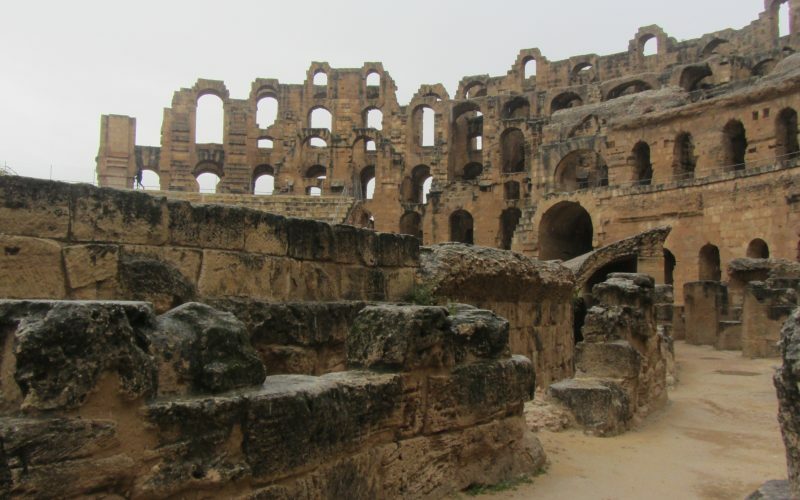 Tour groups often combine El Djem Amphitheatre with the Great Mosque of Kairouan. 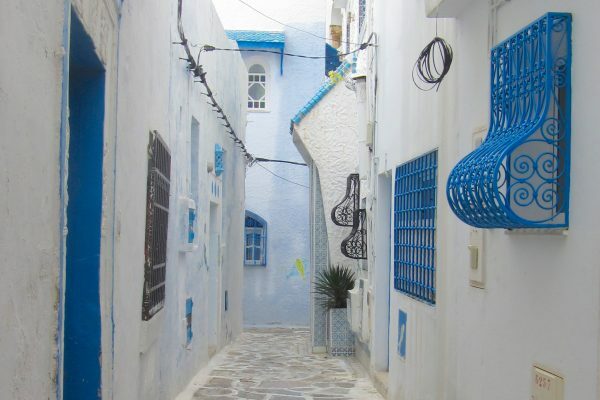 If you are visiting Tunisia, you might also like to read about Hammamet Kasbah and Pupput.